Build your faith today seeing miracles gifted by an unchanging God of love. Be challenged spiritually and experience revival as in ‘the days of old’. 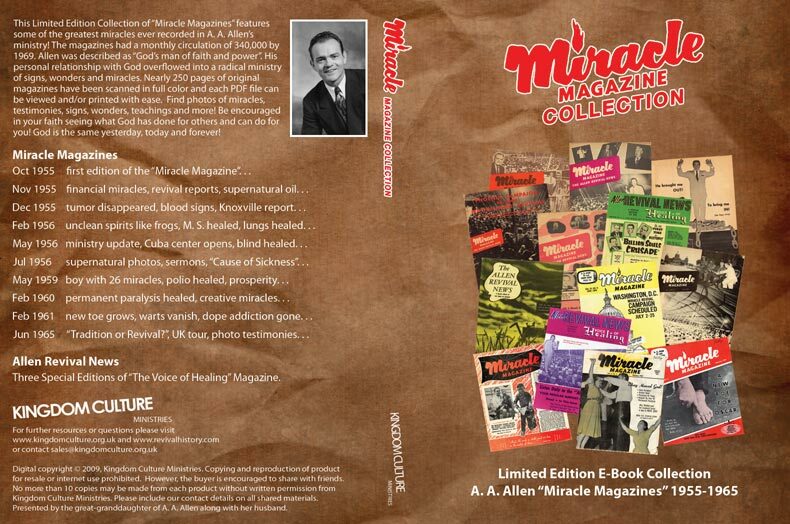 This Miracle Magazine Ultimate Collection features some of the greatest miracles ever recorded in A. A. Allen’s ministry! Allen was described as “God’s man of faith and power”. His personal relationship with God overflowed into a radical ministry of signs, wonders and miracles. Nearly 250 pages of original magazines have been scanned in full color and each PDF file can be viewed and/or printed with ease. Find photos of miracles, testimonies, signs, wonders, teachings and more! Be encouraged in your faith seeing what God has done for others and can do for you. This collection includes 10 best loved Miracle Magazines published during it 15 year distribution. Additionally, you’ll find 3 rare Special Edition Allen Revival News magazines published by and about the Allen ministry for the Voice of Healing circulation. If you’re not sure what magazines you’d like to get most, this collection will give you countless hours of encouragement and faith building. It doesn’t matter if you are a history lover, curious individual or simply hungry for Jesus to impact your life today, this collection is sure to touch your life. God is the same yesterday, today and forever. Not sure about purchasing the full collection? Does a particular magazine interest you most? All of the magazines in this collection can be purchased individually plus others not in this collection! See our full list of the Miracle Magazine or Special Editions including “Allen Revival News”. The impact of the Miracle Magazine was far reaching and many reported healing occurred simply through the faith they built reading all God did under the “Big Top” tent. Build your faith today seeing and reading of miracles from the God who is the same yesterday, today and forever! Read sermons A. A. Allen preached bringing countless into God’s Kingdom. Study what God was doing in the body of Christ over 50 years ago and be challenged to take your relationship with God even deeper today. A. A. Allen was a famous revivalist of the 1950′s – 1960′s. Starting in October 1955, his ministry published the monthly ‘Miracle Magazine’ chronicling the events, sermons and countless testimonies of his Miracle Revival ministry. The magazine grew to have an international and bi-lingual subscription of at least 340,000 by 1969. Some Miracle Magazine issues had over 500,000 copies distributed as early as 1957. 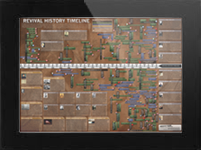 Downloading your favorite revival history resources couldn’t be easier. We partner with Amazon Web Services to bring you the simplest and quickest way to get what you order. Once you have completed your order, you will be directed to a page on our site where you’ll find your receipt and links to download your purchases. This will also be immediately emailed to you after finishing your order. of this incredible Miracle Magazine edition.